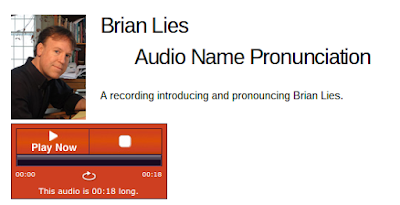 I'm honored to welcome author-illustrator Brian Lies to Watch. Connect. Read. We chatted about bats, his batwagon, the Riverside Public Library, picture books, a special gator, reading, and his last name. I wrote the words in orange, and he wrote the words in black. Thank you, Brian! I have illustrated bats for a DECADE now! Hundreds of thousands of copies along, I still get e-mails from young readers and their parents about what the books mean to them. However, I’ve been so involved in daily life—raising my daughter, working on the next book and visiting schools around the country—that I didn’t realize how much time had gone by until Houghton Mifflin Harcourt announced a “Box of Bats” gift set of the first three bat books, coming out next year. It will commemorate the tenth anniversary of the publication of BATS AT THE BEACH in 2006. My batwagon forces me to drive very politely. You can’t react the way you normally might if someone cuts you off or does something dangerous, because there’s only one car like it. It’s recognizable. The batwagon is our family car, a Nissan Cube, covered with a colorful vehicle wrap. 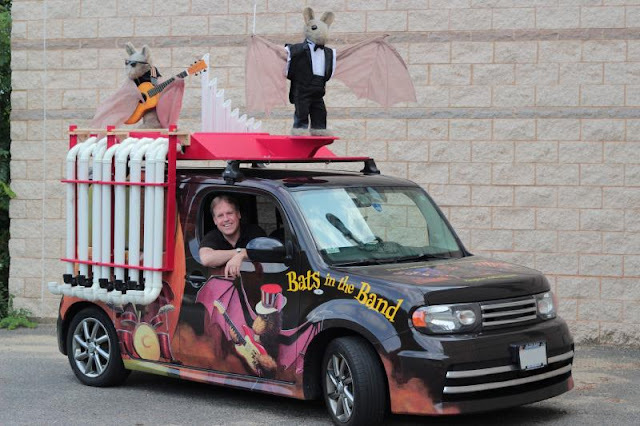 When the PVC pipe organ I built (think “Blue Man Group”) and two 3’ fiberglass-and-fake–fur bats are attached to it for book events, it’s pretty unusual. From the inside, though, you feel like you’re driving any regular car, except for the odd looks and waves you get from other drivers. 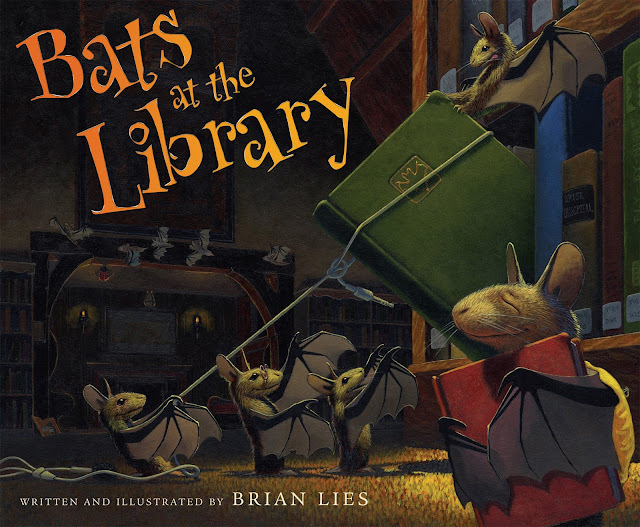 Did you know the Riverside Public Library is the setting for BATS AT THE LIBRARY? My grandparents lived in Riverside, Illinois, and in the summer, we’d drive from my home in Princeton, NJ to visit them. Afterwards, we’d drive on to my other grandparents in Minnesota, and from there, did 3-week tent camping trips throughout the U.S. and Canada (have you ever seen a jackalope?). The Riverside Public Library was a place that made me want to write. Deep, red leather Stickley chairs, heavy Arts and Crafts tables and stained glass windows created a kind of imaginative embrace, and I’d take a pad of paper there and write. It’s still my favorite library building in the U.S.—a cathedral of the mind. If you visited my studio you might be disappointed at how ordinary it is. No vaulted ceiling, no collection of bones, odd things in bottles, or taxidermy. Just a lot of books, a drawing table and computer desk. People who visit think it’s more interesting than I do. But the things in there are so familiar to me—the sketches taped onto the wall, my childhood books and some of my favorite childhood toys, as well as Post-its and sketches for a bunch of books I plan to do in the future—that to me it just feels like the place I go to work. I tell students in schools that you don’t need a fancy or elaborate place to write or illustrate stories—you just need a place where you can concentrate. And it helps if it’s a space that’s all yours—so you don’t have to clean everything up at the end of the day! When I visit schools, I try to remember what it was like to be in the fifth grade audience when an author visited my school. I thought being an author sounded like the best job in the world, but I knew I didn’t have enough talent to ever publish a book. I made the fatal mistake of thinking that talent was more important than hard work and learning, and that my fifth grade level of skill (or absence of skill!) proved it’d be impossible for me in the future. So now, I try to speak to those students in the audience who believe the same thing, to get them to ease up on the self-criticism and dare a bit more (something I feel state-mandated testing is killing), and to think that perhaps their own horizon may be much farther than they can imagine. . . when they gain a little more height and a little more experience. I always show some artwork I did in elementary school, which usually brings a wave of laughter. If I can make one student in each group I present to think, “He was really bad in second grade, and now he’s publishing books, so maybe I’ve got a chance at what I’d like to do,” then I’ve done my job. 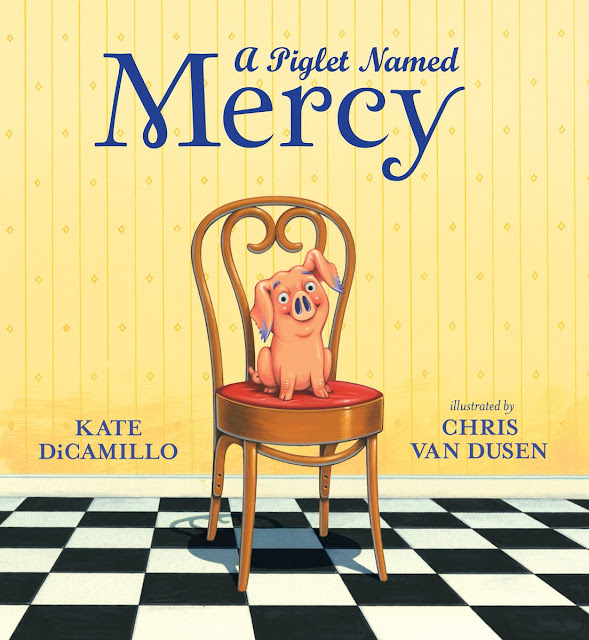 Picture books are the entry ramp to the highway of literacy. They’re one important way we learn that one idea follows another, and another, and becomes a story. Each picture book is a whole world tucked into 32 pages, sometimes spare, and sometimes complex. Great picture books are easy to underestimate—apparently simple, but often much more intricate and full of truths if you give them the time they deserve. I’m disheartened when I meet younger and younger students who declare that they’re “out of picture books, and reading chapter books,” because though they see it as a sign of maturity and accomplishment, they’re missing out on a lot of great stories, as well as a firmly-grounded understanding of sequential storytelling, which will help them as they create their own stories. I suspect there’s a lot of parental bragging going on about having kids who aren’t reading picture books anymore, too. I’m finishing up a new book, coming out next spring, called GATOR DAD. The book grew out of my own experiences as a stay-at-home Dad in the late 1990s, and my feeling that I wasn’t represented in picture books. Dads are generally depicted as amiable and loving characters, but they’re often a punch line, bumbling and incompetent. So GATOR DAD is a competent and committed alligator Dad with his three kids, making their way through a day together— from fishy pancakes, to a vast pillow fort, to the final tuck-in—not doing anything especially meaningful, but getting a lot done through their time together. I intend it to be a celebration of the energetic and sometimes unorthodox ways Dads do things, compared to many Moms (“If something’s gone bad in the fridge. . . I’ll let you smell it, too”). Mr. Schu, you should have asked me about my last name, because you could have saved untold numbers of people from pronouncing it wrong! The name came from Luxembourg around 1840, attached to my many-greats grandfather, and settled itself in Illinois. It’s been handed down to people who will never be able to enter politics ever since. Almost everyone in the U.S. with that surname is a relative. 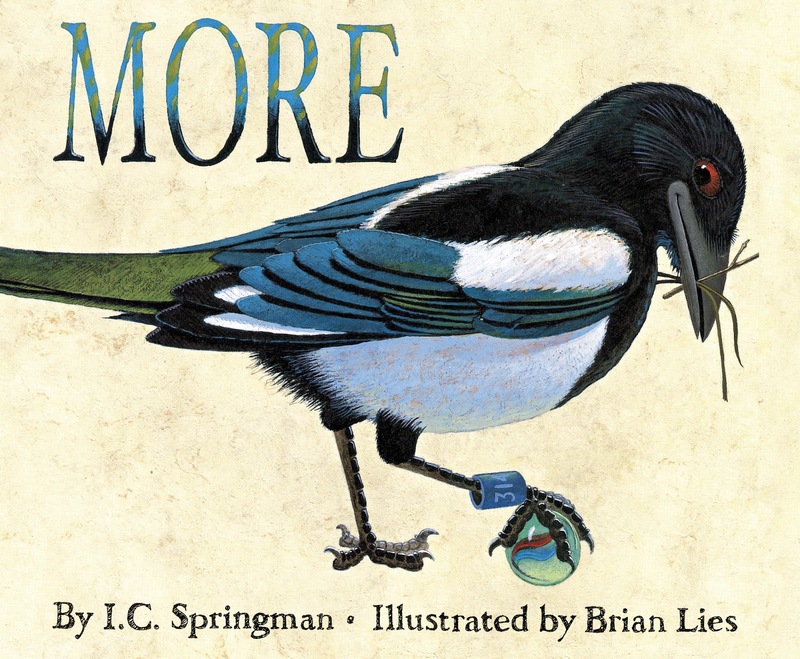 Borrow Brian's books from your school or public library. Whenever possible, please support independent bookshops. Vote for the 2015 Kids' Comics Revolution Awards!